Every artist will at some point find themselves facing a blank page, blank canvas, or empty table, and gazing out the window wondering “What Now?”. Based on that familiar feeling, Chris Maddison has staged the perfect scene for his final contribution to the Iron Builder competition. 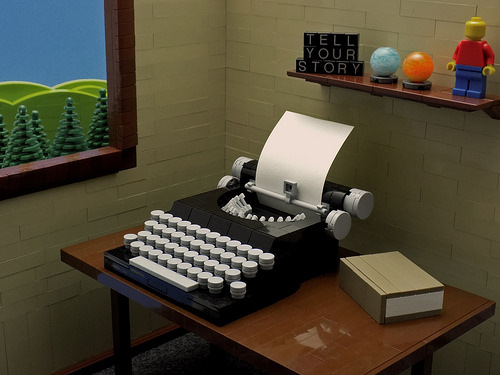 The seed piece has been brilliantly put to use as the type hammers inside a beautiful vintage typewriter. Sitting on the desk next to it is what can only be a dictionary or thesaurus, while his mantra and inspiration adorn the shelf above. Everything in this scene is made from LEGO. My favorite feature is the depth of field Chris has created out the window. In Chris’s own words: “We are creators. To make art, to convey an idea or emotion, to play well… it’s in our blood. Tell your story, whatever it may be”.